Hitschler Softi Kau Bon Bon's are some of the most interesting candy you will ever eat. 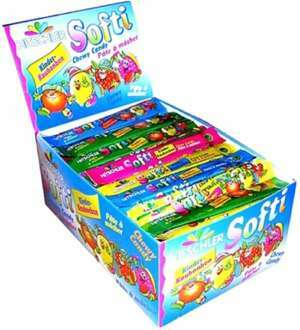 At first when you unwrap and then pop one of the assorted fruity flavors in your mouth, you get a sensation of eating a sour tasting taffy. As you start chewing on one of the bon bons, an amazing thing happens: the candy just starts melting away in your mouth and before you know it, it is gone! By that time, you are already craving another one, not only because of the wonderful fruity taste, but because you want to feel the "magical" sensation of the mysteriously disappearing candy again. These are a wonderful fundraiser for German language students, band groups, youth groups, etc.